This year, ‘Eurovaistinė Christmas Run’ invites you to the 44th annual run. 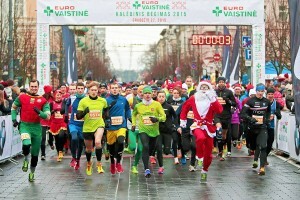 It is the oldest Christmas run in Lithuania with the biggest number of participants. The first race in 1975 was organized to celebrate the New Year in a group of 77 like-minded enthusiasts. Today we count over 3500 runners. Majority of them runs with Santa Claus, Snow White or any other costume. Festive race offers you 12k, 6k or 3k run experience in magnificent Vilnius Old Town. Children are welcome to enjoy white winter 200 metres Kids run. The online registration is open till December 14, 2019. Participants may register in the information centre (location will be specified later) on December 15, 2019. The registration will be closed 30 minutes before the start of each race. Kids run is 200 m. Children from 2 to 12 years old are welcome to participate in this run. Participants may pick-up their starting package and the bib number in the information centre (location will be specified later) on December 13-14, 2019, from 10am to 8pm. On the event day number pick-up will be closed 30 minutes before the start of each distance. Package and bib number pick-up will be available from 9:30. Winners of the run will be awarded with diploma, award-winning cup and partners presents. All finishers of each distance will be awarded with medals. It is necessary to safely secure your bib number to the front of your shirt. It is not allowed to cut the number, fold it in half or modify it in any other form. It is forbidden to take off the timing chip as it is the way to record your result. Runners who will participate without a clearly visible bib number will not be allowed to continue the race. Storage and changing rooms will be available at the day of the event. *Personalized numbers (with participant’s name on it) will only be available for those who complete registration until 10.30. PE “Tarptautinis maratonas”, legal entity code: 300561278, address: Vytenio str. 6/23, LT-01122, Vilnius, tel. +37064732998, email: info@kaledinisbegimas.lt, is a data controller responsible for collecting and processing data submitted by persons participating in “Vilnius Christmas Run”. Data about the participant’s name, surname, age group, gender, achieved results (time, place reached), as well as the city and country are publicly available on the website www.kaledinisbegimas.lt. In order to ensure transparency of the results, the participant automatically agrees that the data will be made publicly available on the website when registering for the event.